SHAH ALAM: A factory operator, who is also a PKR member, was killed when he was slashed by parang wielding men at PKNS Flat, Jalan Plumbum, Section 7, here, yesterday. 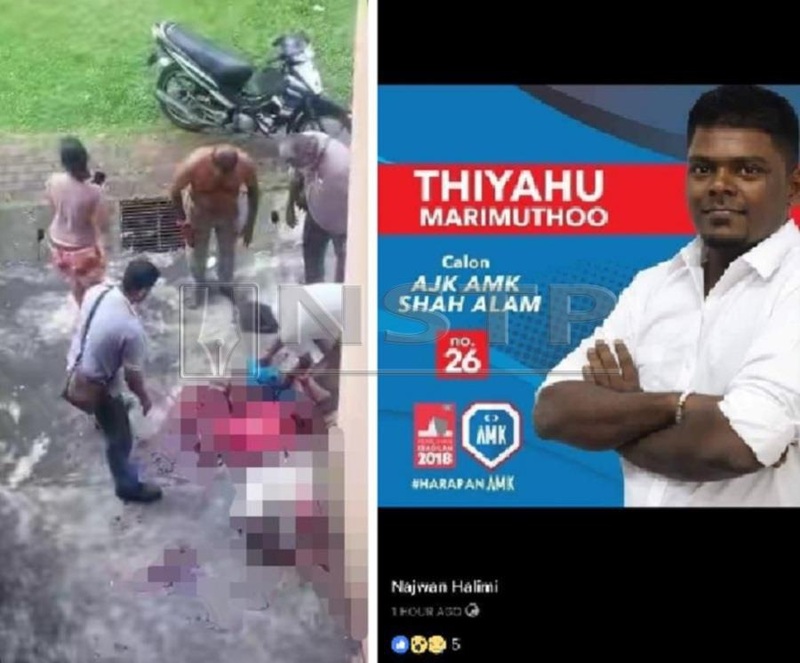 In the 5pm incident, the victim, M. Thiyahu, 30, sustained serious head and body injuries from the attack and was pronounced dead while receiving treatment at nearby Shah Alam Hospital. District police chief Assistant Commissioner Baharudin Mat Taib said police were informed of the incident at 5.16pm. "Based to initial information, the attackers arrived at the flat in a silver Proton Waja. Three men, armed with parang." He said after the attack, passers-by took the victim, who had serious slash wounds on the face, back of the head, right arm and both legs, to the hospital nearby. "Sadly, he was pronounced dead at 6.30pm at the emergency ward while receiving treatment." Baharudin said a post mortem will be held today to determine the cause of death and an investigation has been open to shed light on the incident. "We are still in the midst of finding out the motive of the attack and identifying the suspects involved," he said, adding that the case is being investigated under Section 302 of the Penal Code for murder. Baharudin said those with information of the incident should contact the investigating officer ASP K. Vignesh Kumar at 03-55202222. In the meantime, a 21-second video clip of the incident has been making rounds on social media showing the victim, covered in blood being helped by several passers-by. Kota Anggerik assemblyman Najwan Halimi, via his Facebook account, has sent his condolences to Thiyahu's family. He confirmed the victim was one of the candidates vying for PKR Youth posts last October. "With great sadness, I would like to offer my condolences to the family of the late M. Thiyahu. May the family remain strong in facing this tough moment." "I knew Thiyahu personally as good mannered young man who love helping those in need especially those in the flat areas. " "He was a dedicated PKR member and also a PKR Youth candidate for the Shah Alam branch during the recent party polls."